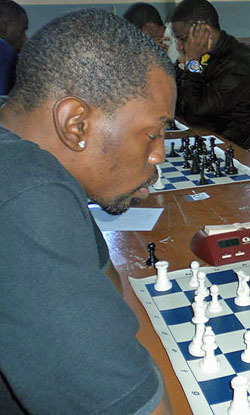 Newly appointed National Master Daren Wisdom, scored 4.5 points from 6 games to win the eighth staging of the Clarendon Chess Gala, held at Glenmuir High School in May Pen, Clarendon last weekend. Wisdom secured the title with an early draw against tournament favourite National Master Peter Myers in the sixth and final round. Second place went to Myers who also ended on 4.5 points, but was relegated to second on tiebreak. Five players ended on 4 points to share third place, they include, Paul Brooks, Mark Henry, National Master Andrew Mellace, Zachary Ramsay and Peter Thomas. Brooks was awarded the bronze medal when the tiebreak system was employed. The award for the top player in Class A went to Glenmuir’s Andrew Ellis, who also took the title of top player from Clarendon. Veteran Mark Henry took the award for being the top player in the Expert category. In the Intermediate section for players with a Jamaica Chess Federation rating below 1600, St. Catherine’s Odean Wright took home the top prize after ending on five points from six games. Second place went to St. Jago’s Roderick Clifford on 4.5 points, while third went to Camperdown’s Roger Williams who also ended on 4.5, but was relegated to third on tiebreak. The tournament was organized by the Clarendon Chess Association under the auspices of the Jamaica Chess Federation. The next open tournament on the Jamaica Chess Federation Calendar is the NM John Powell Memorial Open, currently scheduled to take place during the last weekend in January 2011.